A beautiful 1/3ct I-I1 colour and clarity diamond claw set solitaire, on an 18ct white gold ring. The Leo Diamond is a product of four generations of expertise in the art of diamond cutting, resulting in the first diamond that was independently certified to be visibly brighter than other diamonds with 8 additional facets compared to traditional round brilliant cut diamonds. Leo Diamond rings are independently certified by the IGI/GSI for colour, clarity, carat and cut. 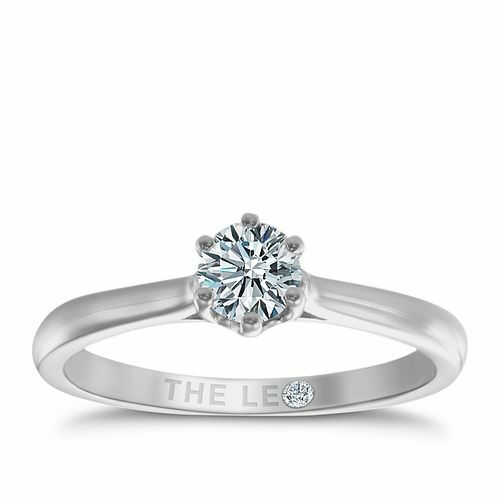 Leo Diamond 18ct white gold 1/3ct I-I1 solitaire ring is rated 5.0 out of 5 by 3. Rated 5 out of 5 by Anonymous from Pretty and sparkly ring... I love my ring ... It's maybe not the biggest but it's a lovely sparkly ring which does catch the light beautifully. Paired with my wedding ring and my diamond eternity together it all looks perfect and I couldn't be happier! I would definitely recommend! I WOULD SAY IF YOU ARE ON A BUDGET THIS IS A REAL GEM AND YOU WON'T BE DISAPPOINTED. Rated 5 out of 5 by Anonymous from Love the ring I got this ring as a gift and I absolutely love it. The size of the diamond is perfect for slim fingers and sits really well.